The battle btetween the Nova Posse and Mazool’s troops intensifies. Our heroes are forced to retreat from the planetary base of their adversary and join the space combat near the Black Hole. Donatello continues to experience cosmic awareness with the help of the Turnstone when Sarnath states that he’s been contacted by his companion Qark. Sarnath attempts to draw Don’s attention away from the Stone, but Donatello punches his friend and states that he has no interest in Sarnath’s “dog” as he’s far too occupied being “one with the universe”. Sarnath pleads with Don to remember where they are and to grasp what the Turnstone is doing to him and the universe beyond. Nova Posse’s ship takes a direct hit that fries their control panel, preventing them from making contact with their allies. Since the Posse’s craft is identical to those piloted by Mazool’s forces, our heroes appear as enemies to their friends in the Stump armada. Sarnath surmises that Don is in control of the Stone and attacks him, trying to gain control of the powerful object. Sarnath manages to distract Don by getting him to focus on the peril that his brothers are in, and uses the opportunity to wrest the Turnstone from the Turtle’s grasp. Sarnath states that he is far better suited for the task at hand. The multi-armed alien is instantly “plugged in” to universal awareness, and he states that it’s time for Don to go, using the Turnstone’s powers to teleport Don to the ship that his companions are aboard. 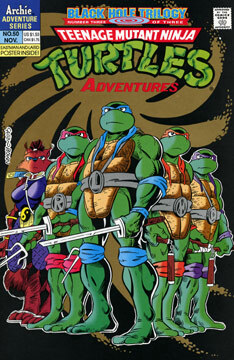 Sarnath then faces the Sons of Silence and tells them that while they would have been able to control Donatello, they won’t be able to control him. Sarnath states that “this must end” and a huge projection of the alien is seen in space, surrounding the Black Hole. Suddenly, dozens of spacecraft explode as their engines overload. Nova Posse is able to save their ship with quick action by their helmsman. Sarnath teleports the Sons of Silence away… and then the Black Hole collapses onto itself. On the planet below, Mazool vows to hunt down and destroy the Nova Posse. Don explains to Leo that he, Sarnath and the Sons of Silence had been in another dimension. The Stone had gotten control of Don, and without Sarnath’s help, he could have destroyed the universe. Leonardo asks about the Black Hole and Don states that Sarnath collapsed the Black Hole and sealed the dimensional gateway – he won’t be returning.